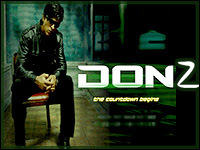 Don 2 - The Chase Continues is an upcoming hindi action thriller film directed by Farhan Akhtar. It is the sequel to the 2006 hit film, Don: The Chase Begins Again, which itself is a remake of the cult 1978 blockbuster film Don, therefore making it the first sequel to a remake in Bollywood history. The film has Shahrukh Khan, Priyanka Chopra, Boman Irani and Om Puri, reprising their roles from the previous film; with Lara Dutta, Kunal Kapoor. The film's original score and soundtrack has been composed by the trio Shankar-Ehsaan-Loy. The movie going to release end of Dec, 2011.